The ramifications from Iraq’s elections do not mean we will witness a better Iraq, but it will certainly differ from the one we know of today. The top four winners, starting from the highest were the Sairoon (Forward) Alliance, al-Fatah Alliance, al-Nasr (Victory) Alliance and the State of the Law (SOL) Coalition and the KDP sharing the fourth place. Sairoon, which won with 54 seats, is led by prominent Shi’ite nationalist figure, Muqtada al-Sadr, in alliance with the Iraqi Communist Party. Al-Fatah came in second with 47 seats and is led by pro-Iran Hadi Al-Amri, leader of Badr Corps, a guerrilla force formed by Iran to fight the Iraqi army during the Iran-Iraq war. Al-Amri is also known for being one of the Popular Mobilization Unit’s (PMU) main leaders, which is why many media platforms refer to his political coalition as the PMU representative, a very inexact generalization of a diverse force. Prime Minister (PM) al-Abadi’s al-Nasr only came in third. This came as a surprise, as most were betting on his victory following the government forces’ defeat against ISIL and his impressive diplomacy in dealing with the Kurdish referendum, retaking Kirkuk without causing a civil war. Finally, there was a tie at 25 seats between former PM Nouri al-Malki’s SOL and Barzani’s Kurdistan Democratic Party. The Iraqi parliament, known as the Council of Representatives, consists of 329 elected seats, with a quota for women and minorities. The winning party needs a majority of 165 seats to form a cabinet and appoint a PM. Thereupon, forming coalitions with other parties is paramount, and it would entail candidates that please all parties involved. Sairoon and al-Fatah are very similar, in that both derive from paramilitary backgrounds. However, they have major differing principles. While a powerful nationalist whom always opposed Iran’s dominance and US military presence in Iraq leads the former, the latter is the leading pro-Iran figure in these elections, and the man behind Iran’s role in the PMU. Thereupon, the first coalitions after the results were formed based on the Iran factor. Sairoon so far announced its possible alliance with al-Abadi’s al-Nasr and al-Hikma (Wisdom) alliance, which is led by former pro-Iran religious and political figure al-Hakim. The opposing group is predictably al-Fatah with SOL, as both share the Iran allegiance, and aim at preventing al-Abadi from gaining a second term. Muqtada al-Sadr once led a paramilitary group known as the Mahdi Army, which steered a violent resistance against the US invasion in 2003 and was greatly involved in the sectarian conflict between 2006 and 2008. Al-Sadr was also the first Shi’ite figure who criticized Ayatollah Ali al-Sistani, Iraqi’s highest religious figure, for his silence over the invasion. Regardless of his role in the sectarian civil war, he was able to create a Shi’ite-Sunni resistance alliance against the US invasion, which healed the scars of the sectarian schism. The US might be trapped now: on the one hand, Sadr has had a prominent anti-US posture, but on another – he is also the perfect counter against Iranian hegemony. Although to what extent would Sadr allow himself to become a tool for US proxy wars against Iran? Nevertheless, past conflicts have proved never to be obstacles to present political interests. Allegedly, mediations between US officials and Sairoon occurred, where both sides signalled willingness to cooperate. The Shi’ite Islamist Da’wa Islamic Party, which has been the lead of all post-2003 Iraqi governments, lost the elections for the first time in a major defeat. This was expected due to the divisions caused by personal interests between al-Malki and al-Abadi since 2014, when both led two different coalitions from outside their party. Alternatively, their loss would also derive from the fact that they failed to deliver any improvements in education, health care, security, economy, infrastructure and youth employability, creating ethno-sectarian and corrupted institutions instead. The secular drift came as a result of the Da’wa-led Islamist failure, similar to the rise of Islamist political movements in the 1980s, which resulted from the let-downs by the socialists and the Pan-Arabism in Iraq and beyond. In the 2014 elections, various secular parties and politicians from the Iraqi Communist Party to right-wing liberal parties formed the Civil Democratic Alliance. This coalition promoted a civic state against the ethno-sectarian quota. The Islamist parties waged a media war with propaganda against the coalition, labeling it ‘western’ and ‘atheist’. With no multimillion US dollars financial sponsorship, regional support or paramilitary groups, it won 3 seats in their first round. Thus, politicians started presenting themselves as ‘secular’ such as al-Malki SOL’s former candidate and media figure, Ahmad Mullah Talal. Secular politicians existed in post-2003 Iraq such as Iyad Alawi, who was interim PM in 2004. Nonetheless, the distinction with the newest ones, brought up by the Civil Democratic Alliance, is their new vision for Iraq - one that resists the triangle of administrative and financial corruption and the ethno-sectarian quota in governance. Alawi might be a secular individual, but never criticised the sectarian quota. The anti-sectarian secular presence in today’s Iraqi politics might be broken up in different coalitions – however, its presence in Sairoon and its mentions in political media platforms is definitely an effective beginning. Iran benefited greatly from Iraq’s power vacuum following the fall of Saddam Hussein, by utilizing its new and existing proxy tools such as Badr to dominate the political scene. Iraq’s PM today must not only be a Shi’ite Arab to match the sectarian quota, but also favoured by Iran. Qassem Soleimani, who heads Iran’s Islamic Revolutionary Guards Corps and is known for being the most influential non-Iraqi figure in Iraq, is arguably one of the major lobbyists in Baghdad’s parliamentary bargaining to maintain Iran’s influence in the upcoming government. This comes as a shock for Iran towards the Sadrist-Communist alliance’s victory in the elections. Al-Sadr is the most prominent anti-Iran Shi’ite figure, and his stance cannot be ignored due to his great political influence. The anti-Iran discourse within the post-2003 Iraqi government was always driven by Sunni Arab and Kurdish officials, and with the support of their co-regional partners from Sunni Arab states or Turkey. 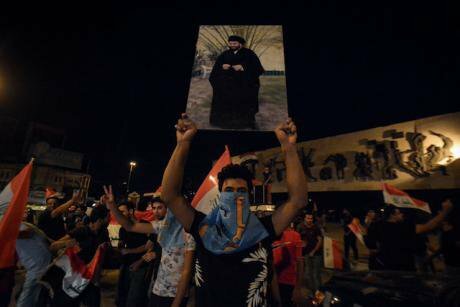 However, the Sadrist rise in government means that Tehran is facing a Shi’ite motivated opposition from Iraq, which is potentially its most strategic threat in Iraq since 2003. This is due to its dependence on the Shi’ite sectarian-cultural linkage and its influence towards the country’s largest community and Shi’ite political parties. These ramifications do not necessarily mean that we will witness a better Iraq; nonetheless it will certainly differ from the one we know of today.